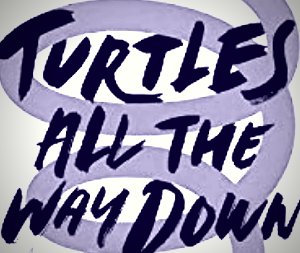 Turtles All The Way Down (and Eleanor and Park) is set in the U.S. In the United States, gun crime – particularly mass shootings in high schools – is a terrible, rampant epidemic. I was reminded of this in Turtles when Aza, casually, makes reference to having to pass metal detectors as she enters school. These metal detectors are a real thing used in real schools as a preventative measure for students bringing in weapons. Now, I realize that the next part of what I’m going to say is a tangent – neither book makes mention of guns at all – but it’s a related tangent in that all of these thoughts sparked off an idea. Imagine a typical young adult novel in which a typical high schooler is going about their everyday life. They have friends and issues and a whole character arc. As the novel continues, the tension builds. Because we, as readers, want to know what happens next. We want to character to get their happy ending. Now, imagine what would happen if, right near the climax of the story, the main character is in school, about to find out if they get the big part in the school play or if the person they have fallen in love with loves them back or whatever thing the plot has been driving at so far. And then in walks another student with a gun who kills everyone right there. It would be an ending. And it would be an ending that, pardon the pun, would have people up in arms. It breaks the unspoken contract between author and reader to resolve the plot within the confines of the novel. No one would publish such a book. I, personally, would be heartbroken to read such a book. But I’m also tempted to write one. Because it would be powerful. An important statement. Part of me thinks that such a book should exist just to shock people. Not for shock’s own sake, but to try and provoke readers to action. Because action is what’s needed in the face of gun crime. I know I’m not alone in feeling strongly about the issue of gun violence, but even more people need to get on board, and books/words in general are a great vehicle for doing such things. Just think, as upsetting and as it would be for characters you’ve invested your time in getting to know to get such a horrible ending, and as unsatisfying as that ending would be, how much worse is it that it happens to real life people who should have most of their real lives ahead of them? Untold stories are, perhaps, the saddest thing of all.